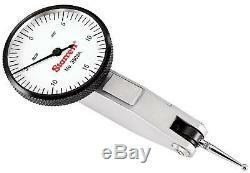 Starrett 12527 Dial Test Indicator with Dovetail Mount and 2 Attachments, White Dial, 1.57" Diameter, 0.030" Graduation Range, 0.0005 Graduation. Three dovetail positioning mounts work with most existing test indicator accessories. Precision gear-driven design with smooth, jeweled movement. Contact point reverses automatically, always maintaining clockwise hand rotation. Contacts are frictionally adjustable and replaceable. Meets or exceeds ANSI/ASME accuracy specifications. Indicator includes two dovetail clamps and case. All stock is at our USA warehouses. In case of defectives found, only factory defects are accepted as the reason of return. As mentioned before we are extremely fair and will happily work with you to find a solution to any problem. As you can tell from our feedback, pretty much every single one of our customers is a happy one. The item "DIAL TEST INDICATOR STARRETT #3909A" is in sale since Saturday, July 21, 2018. This item is in the category "Business & Industrial\CNC, Metalworking & Manufacturing\Metalworking Tools\Metalworking Inspection & Measurement\Indicators". The seller is "deal-runner" and is located in Fenton, Missouri, United States. This item can be shipped to United States, Canada, United Kingdom, Denmark, Romania, Slovakia, Bulgaria, Czech republic, Finland, Hungary, Latvia, Lithuania, Malta, Estonia, Australia, Greece, Portugal, Cyprus, Slovenia, Japan, China, Sweden, South Korea, Indonesia, Taiwan, South africa, Thailand, Belgium, France, Hong Kong, Ireland, Netherlands, Poland, Spain, Italy, Germany, Austria, Israel, Mexico, New Zealand, Philippines, Singapore, Switzerland, Norway, Saudi arabia, Ukraine, United arab emirates, Qatar, Kuwait, Bahrain, Croatia, Malaysia, Chile, Colombia, Costa rica, Dominican republic, Panama, Trinidad and tobago, Guatemala, El salvador, Honduras, Jamaica, Antigua and barbuda, Aruba, Belize, Dominica, Grenada, Saint kitts and nevis, Saint lucia, Montserrat, Turks and caicos islands, Barbados, Bangladesh, Bermuda, Brunei darussalam, Bolivia, Ecuador, Egypt, French guiana, Guernsey, Gibraltar, Guadeloupe, Iceland, Jersey, Jordan, Cambodia, Cayman islands, Liechtenstein, Sri lanka, Luxembourg, Monaco, Macao, Martinique, Maldives, Nicaragua, Oman, Peru, Pakistan, Paraguay, Reunion.